Bird Wilson stands out as a multi-talented professional during her time in Nevada. She was an attorney, suffragist, ranch owner, and mining investor. Yet, it is her work with the suffrage campaign that places her in Nevada’s history. Bird Wilson was born in 1865 in Illinois. She moved to California as a young woman and graduated from the Hastings Law School. Wilson first made history when she became the first woman to practice law in the federal courts of California. 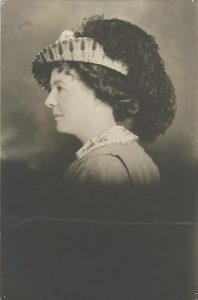 Wilson moved to the boomtown of Manhattan, Nevada in May 1906 and became the seventh woman admitted to the Nevada bar to practice law. In Manhattan, she primarily worked on mining and contract law. By 1909, Manhattan was no longer booming, and she relocated her law practice to the town of Goldfield. A larger city, Goldfield offered a number of activities in which Wilson took part. She was a founder of the Goldfield chapter of the Daughters of the American Revolution, a member of the Goldfield Woman’s Club, and assisted in bringing culture to the mining area during her residence there. She had a variety of economic interests; in addition to her law practice, she became a ranch owner near Indian Springs and had a handful of mining interests in central Nevada. Opportunity to make history presented itself once again to Wilson in Goldfield, as she became the first female stockbroker in the state of Nevada. Despite her professional success as an attorney, stockbroker and investor, Wilson’s real contribution to the state was her dedication to the cause of women’s suffrage. She was the vice-president of the Equal Franchise Society from 1913-1914. She used her legal knowledge to write a pamphlet, “Women Under Nevada Law,” and distributed 20,000 copies around the state. Her passion led her to campaign across southern Nevada for her cause. She championed women’s rights by lobbying the state legislature to protect women and children under existing laws. And she campaigned for laws that would benefit women, including community property laws and the joint guardianship of children. She also worked to improve the lives of all Nevadans through her support of legislation for the eight-hour workday and against capital punishment. In 1917, Wilson left Nevada and moved to Oakland, California where she lived until her death in 1946. Bird Wilson’s legacy to Nevada was her willingness to break gender barriers. She worked hard to improve the lives of women across the state through her support for suffrage and by working to change state laws to improve the lives of all Nevadans. Source: Earl, Phillip I. “Bird M. Wilson,” Nevada Historical Society; and Wilson, B.M., “Women Under Nevada Laws” (typescript), 1912-1913. For more information, contact Joanne Goodwin at joanne.goodwin@unlv.edu.